If you ask the few families who continue to bake Mandaue City's bibingka the secret to creating this delicacy, they'd tell you that the manner of cooking matters as much as the ingredients. Mandaue's bibingka, a type of rice cake made from ground rice, coconut milk and strips, sugar, and yeast or rarely tuba, is popular among Cebuanos, who love its soft and spongy texture. Bibingka makers still bake it the traditional way or what Cebuanos call "inurno" style. This involves the use of terra cotta ovens where charcoal is burned below and above the bibingka mixture. Mandaue's bibingka, with its banana leaf wrapping, is not your typical rice cake baked inside modern ovens, but this is what makes it unique and special. "Ang aso sa uling mas makahatag og mas lamian nga bibingka (The smoke from the charcoal gives the bibingka its distinctive taste)," said Gaga Sereno, 23, one of those selling the rice cake by the Ibabao roadside in Mandaue. Another vendor said there are buyers, like one from Manila, who provide the ingredients but want the bibingka baked in their terra cotta ovens. Since charcoal is placed on thin metal strips that cover the bibingka batter container, it sometimes burn through the banana leaves used as wrapper. This is also why the top of the rice cake is toasty brown. 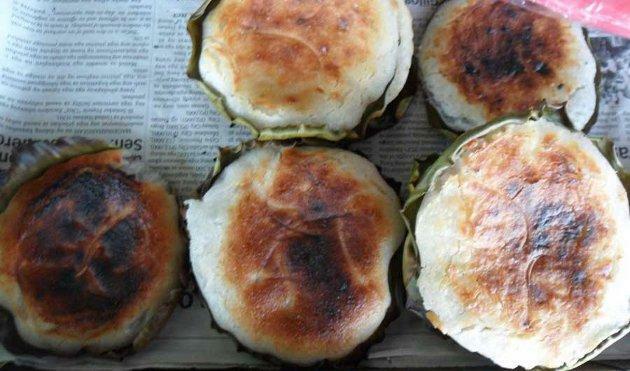 Mandaue's bibingka is sold in packs of threes for P30 in small stalls along Ibabao Street, or fronting the city's cockfighting arena. It is available all throughout the day. Husband and wife Victor and Jonelyn Baynosa sell bibingka as early as 5 in the morning. They wake up even earlier to prepare the ingredients. Mandaue's bibingka is easy to make because it does not require complex ingredients, and some can even be substituted. The main ingredient of this specialty food is the rice flour. Bibingka makers buy rice and then have this grounded or just purchase rice flour. Coconut milk, which can be replaced with evaporated milk, sugar, and yeast are also needed. Bakers once used coconut fermented ale as a leavening agent but find that yeast is cheaper and easier to come by. Getting the milk from shredded coconut meat is easy. Just pour hot water on it and squeeze repeatedly until you get the white liquid mixture used to create the bibingka. According to Victor, the bibingka can also be made with evaporated milk and eggs, if the buyer so chooses. The first-known Bibingkang Mandaue baker and vendor is Claudia Atis. Before she died in the 1990's, she left the business to her children. Jonalyn Baynosa served as Claudia's assistant in the 1980s before she baked and sold her own in 1997. Today, only three families prepare and sell bibingka in kiosks along Ibabao Street in Mandaue City. The Baynosa family is lucky because their kiosk is near a vacant property, where they set up a cooking station with numerous terra cotta stoves. This allows them to sell the bibingka fresh from the cookery. Many vendors used to sell the rice cakes on the sidewalk along Ibabao Street but the City Government has regulated their numbers because they impeded the flow of vehicles and pedestrians. Jonalyn Baynosa said families used to have a maximum of four kiosks each but are now allowed only one. When you're in Cebu, don't forget to taste this native specialty that Mandaue is famous for. The rice cake is perfect for snacks or dessert. Even if you're not familiar with Cebu, it is easy enough to find their selling station. Just tell the taxi driver you're bound for Mandaue City's "coliseum," the more popular name for the cockpit. If you feel adventurous and want to go on a jeepney, look for one with "Mandaue Ibabao" on the signboard route. It passes by Ibabao Street where the bibingka makers sell their product.